The offline monitor of the IR420-D6 series is designed to monitor the insulation resistance of loads in the de-energized state. These loads, usually temporarily operated or de-energized most of the time, e.g. fire extinguisher pumps, slide valve drives etc are supplied from TN, TT or IT systems. During the shut-down periods, hohwever, humidity or other effects may cause insulation faults in the wiring or the loads which may go undetected. Switching the device on may then lead to the tripping of the protective device or may even result in motor fires and the device cannot be operated. 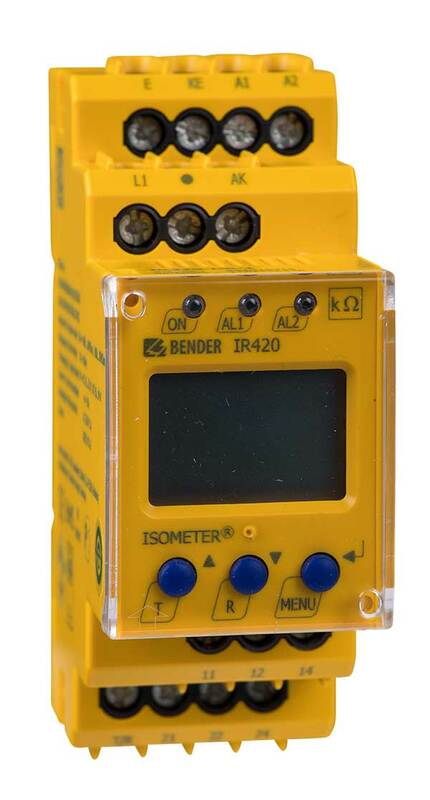 In combination with a coupling device, the Iso­meters can also be used for higher voltages. De-energized loads such as automatic fire extinguisher pumps, emergency drives, ship cranes, slide-valve drives in supply lines (gas, water, oil), motor-driven closing systems, diving pumps, drives for anchors, elevators, flue-gas valves and stand-by generators.